Dobrudja (Romanian: Dobrogea). A region of 23,260 sq km with a population of 815,000 (in 1930), lying between the lower Danube River and the Black Sea. The northern and central part, with an area of 15,580 sq km and a population of 777,600 (in 1971), belong to Romania, while the southern, smaller part (Tolbukhin district) belongs to Bulgaria. Dobrudja has been settled by various peoples. In 1930 Romanians constituted 44 percent of the population; Bulgarians, 23 percent; Turks, 19 percent; Ukrainians, 2.8 percent; Tatars, 2.7 percent; Russians, 2.2 percent; the rest was composed of Gypsies, Greeks, Jews, and Gagauzy. About 30,000 Ukrainians live in Tulcea county in the northern part of Romanian Dobrudja. In the 1st century BC Dobrudja became part of the Roman Empire and then of the Byzantine Empire. In the 7th–14th century it was part of Bulgaria, and in the 11th–12th century, along with the rest of Bulgaria, it belonged to Byzantium. For a brief period it was annexed by Wallachia, and then from 1411 to 1878 it belonged to Turkey. Since 1878 northern Dobrudja has been settled mostly by Romanians and has belonged to Romania, while southern Dobrudja, except for the period 1913–40, has belonged to Bulgaria. In the 10th century Dobrudja was captured by the Kyivan prince Sviatoslav I Ihorovych. Pereiaslavets (Malki Preslav or Preslavets), on the Danube River, was his favorite city. In 1159 Ivan Rostyslavych Berladnyk captured the area for a brief time. Beginning in the 12th century, Galician fishermen and traders settled at the mouth of the Danube. After the destruction of the Zaporozhian Sich in 1775, some of its Cossacks fled to the Danube delta and established the Danubian Sich at Dunavets (Dunavaţul). During the Russo-Turkish War of 1828–9 the Danubian otaman Yosyp Hladky and his Cossacks joined the Russian side in 1828, and only a remnant of the Cossacks was left in Dobrudja. Their numbers increased as peasants fled across the Danube from Ukraine to avoid serfdom and conscription, particularly in 1830–40. During the Russo-Turkish War of 1877–8 some of the Danubian Ukrainians returned to Ukraine. The Ukrainians of Dobrudja today inhabit the main delta of the Danube River in Tulcea county. 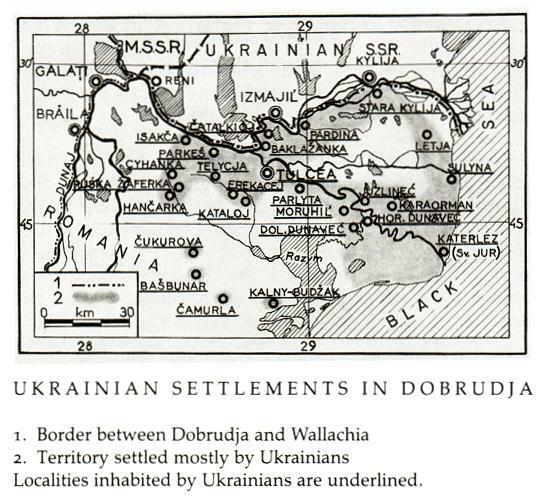 (See map: Ukrainian Settlements in Dobrudja.) They constitute almost 40 percent of the county's population. Beside them, in separate settlements, live the Russians—the Nekrasovtsy (descendants of refugees of Kondratii Bulavin's rebellion in the 18th century) and the Old Believers (Lipovany). According to the Romanian census of 1899, there were 13,700 Ukrainians in Dobrudja and 12,500 Russians. According to Bulgarian sources of 1918, there were 21,500 Ukrainians and 18,500 Russians. The Romanian census of 1930 gives 23,000 Ukrainians and 18,000 Russians-Lipovany. The main centers of Ukrainian settlement in Dobrudja are Kiliia Stara (Chilia Veche, 2,000), Murighiol (930), Teliţa (940), Letia (Letea, 845), Nyzhnii Dunavets (Dunavăţul de Jos, 680), Verkhnii Dunavets (374), Carorman (800), Başpunar (670), Hamcharka (Hamcearca, 460), Chukurova (Ciucurova, 320), Geaferca Rusa (190), Sfintu Gheorghe (540), Pardyna (Pardina, 540), Sulina (Sulyn), and Tulcea (see map: Ukrainian Settlements in Dobrudja). 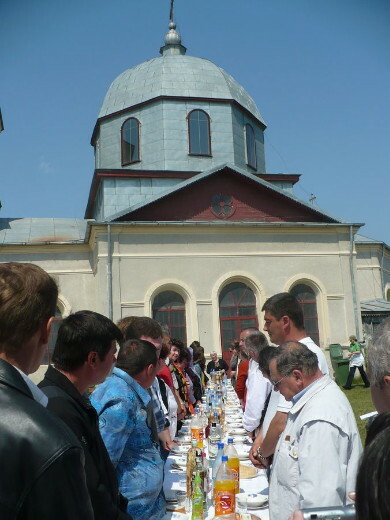 There are about 1,000 Ukrainians in the main city of Dobrudja—Constanţa. The Ukrainians of Dobrudja are mostly fishermen and farmers. They live separately from the Russians and have preserved their Ukrainian language; they call themselves Rusnaks. In 1880–2, Fedir Vovk did some educational work among them. In the 1930s Ukrainians from the Akkerman region and the Ukrainian theater from Chernivtsi visited Dobrudja. After the Second World War the Romanian authorities permitted some cultural activity among the Ukrainians in Dobrudja in the 1950s. The school reform of 1948 introduced the Ukrainian language into the elementary schools of Dobrudja. In Tulcea a parallel Romanian-Ukrainian teachers' seminary was set up, and in 1957 it graduated 54 teachers. In the 1960s all the concessions that the Ukrainians had won in education were abolished.